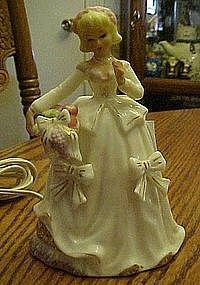 Vintage lady perfume lamp. Lefton? 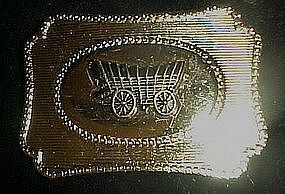 Enesco? 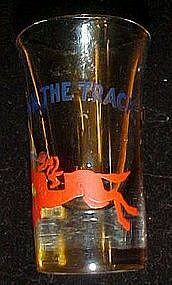 Depression tall shot glass, 2 7/8" in. height, with blue and red enamel decoration. Down the Track, and jockey on a horse figure c. 1930s. Excwellent condition with no damages. 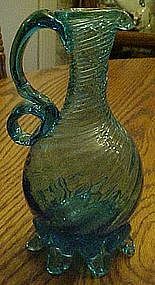 This pretty hand blown pitcher has a distinctive swirl. Applied petal like base and a curvy handle. 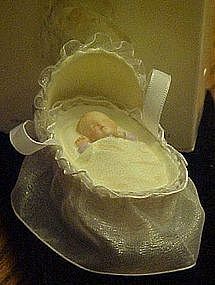 Measures 6" tall. Big pontil on the bottom. Great condition and no chips, but there is a stress crack on the handle. You can't feel it but can see it inside the glass. THis looks like Pilgrim glass but not sure. 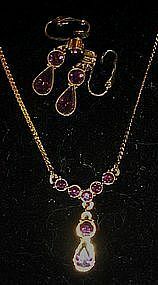 A beautiful earrings and necklace set by Avon. 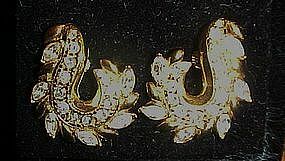 Starfish design encrusted with tiny pearls set in gold tone. Pendant measures 1 1/2" in diameter and clip back earrings are 3/4" diameter. Excellent condition, and set has not been worn. A beautiful shiny gold feathery swirl of clear rhinestones. 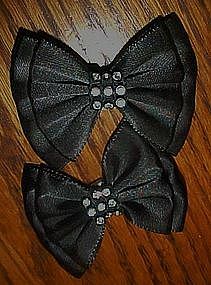 Clip back earrrings measure 1" x 1 1/2" and have never been worn. Made by Avon in 1991. 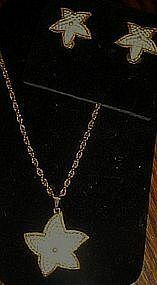 Pretty faux amethyst stones are set with a gold tone setting and chain. Clip back earrings, and a elegant drop necklace. Never worn, and set is in the original box that came with the earrings. Nice silver tone metal bolo slide with braided leather tie and silver tips. 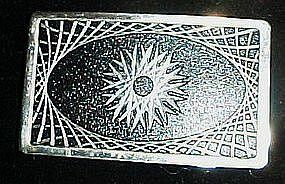 Measures 1 3/8" x 1 3/8". 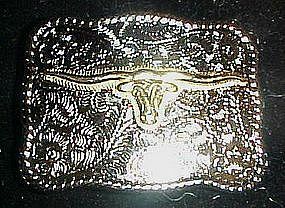 Sculpted cowboy bronc rider with western design and rope border. Nice condition. Made by PARA. 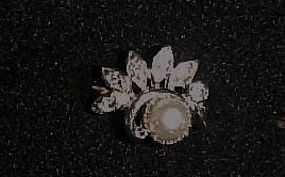 Vintage cultured pearl and rhinestone ring called Fan Fare by Avon. Was originally sold in 1976. Stunning silver tone setting with center pearl and a fan of rhinestone accents. Size 9 1/2. Excellent and shiny brite. 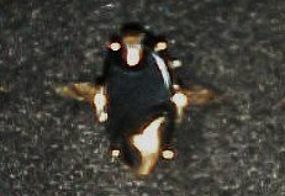 Vintage ring called Night Flower by Avon. Was originally sold in 1978. 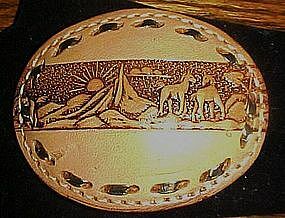 Sculpted gold setting creativly holds the oval faux black onyx stone in place. Size 9. Excellent and shiny brite. Vintage single stone knot ring called Love me knot, by Avon. Was originally sold in 1978. 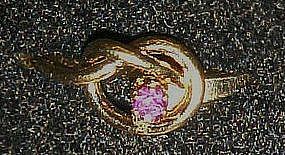 Sculped gold knot witha single amethyst color stone. Size 9. Excellent and shiny brite. 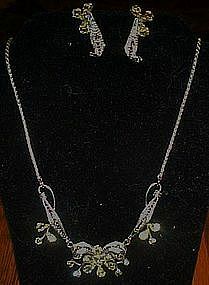 Beautiful Van Dell necklace and earrings set is marked sterling. Bright sparkling crystals set in a delicate filigree sterling. Screw back matching earrings. Measures 15 1/2" long, end to end. Like new.